$12 $10.20 Save 15% 5"
A dan moi is a type of Jews harp originating from Vietnam. Most dan moi are crafted out of a single piece of brass and attached with a string to a decorated bamboo case. Rather than being played against the teeth, like most Jews harps are, the dan moi is played against the lips and uses the oral cavity as a resonance chamber. This gives much more flexibility to player. It is a popular instrument of the mountainous people in the north of Vietnam. It is belong to Hmong culture. Every Hmong man knows how to play this instrument. It is considered as love instrument since they play it for courting. They play in Hmong celebrations. 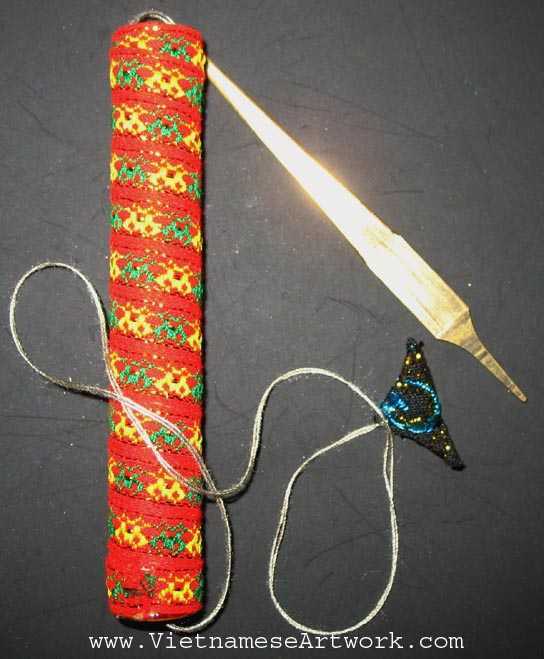 The tube is hand embroidered with Hmong patterns.